The No. 5 player on this list is a former 5-star recruit, a former Alabama Crimson Tide, and a former junior college standout. Now he is in his second season in the starting cornerback rotation for the Buckeyes. Kendall Sheffield’s career began at Alabama, then took a turn to junior college before he finally found his way to Ohio State. He arrived last season with the expectation that he would step into OSU’s starting rotation, which he did. As a redshirt sophomore, Sheffield finished eighth on the team with 40 tackles and his nine PBUs was second most behind Denzel Ward. Last year was a learning experience for Sheffield, whose ebbs and flows were dramatic. He got better each week, however, and his confidence grew. This year, even more is expected. In fact, his name is appearing on all kinds of mock drafts already. Sheffield came to Ohio State with immense expectations, and this should be the year when those expectations get met. Sheffield is arguably the fastest Buckeye on the team, so he runs very well. He is also an aggressive defender, to a fault at times last season. He has no concerns about helping out against the run and will put his body wherever the assignment calls for it to be. Run support is part of the job description and he looks to enjoy living up to the billing. Sheffield was a dynamic return man in junior college, but has not done any returning at OSU, and likely won’t. If he is going to make any noise in the return game, it will have to be on defense. Sheffield broke up nine passes last season, but is still waiting for his first interception. His ability to find the football a blink sooner could allow him to get two hands on the ball moving forward instead of just one. Kendall Sheffield should be completely comfortable this season. He knows what Ohio State is and what it takes. He ran track in the winter, which gives you an idea of how much more comfortable and at ease he is now. That comfort should be on display this season, as will be his speed and physical nature. In the spring, Sheffield was causing fumbles regularly, and that will need to continue this season if he is going to be the playmaker that everyone is expecting. With his speed and return skills, any interception is an opportunity to score, as is any fumble recovery. If Sheffield can find himself around the football more this season, expect him to also find the end zone. 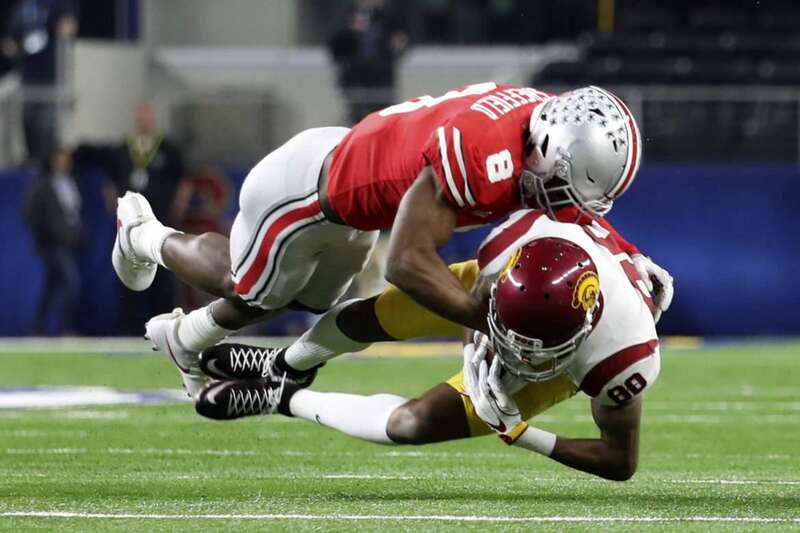 It seems that many of the OSU DB’s that have gone in the first few rounds of the draft started slowly (there are exceptions) and took off in their second solid year. I think the same will hold true for Kendall – but the good news is that if he doesn’t make great strides there are a couple kids in the wings who should be ready to produce (Okudah and Wade). I’m very interested to see if the coaching of Taver produces the same or similar results as that of Coach Coombs. Go Bucks! Based on his performance last year, I simply don’t see how this can be. He is a guy whose play doesn’t even warrant him being penciled in as a starter…he should be competing for the spot. Thus, for him to be tabbed as the number 5 playmaker on this defense is odd (and scary). Hopefully he does a 180 and this pans out to be true… but at this point this is just wishful thinking and projecting based on peoples’ obsession with his measurables (because the play just hasn’t been near to standard). Maybe he surprises. Hope so. His play the second half of the season was much better and with expected growth he should be fine. Perhaps first round fine? You’re being way too critical Christopher. Kendall Sheffield played well overall. Just because you don’t play like a first round top 10 pick on every snap doesn’t mean you aren’t good. He was just fine last year and played even better towards the end of the season. I disagree. Most of the season he played very poorly. At one point he was an automatic pass interference and it became laughable. So any improvement you speak of is relative to such a poor beginning… and if I am not mistaken his playing time got reduced mid season due to the poor play. I am as hopeful as the next guy that he is now ready to be the next Antoine Winfield…but revisionist history won’t make that happen. Yeah that’s not correct. You’re using some of his early season (remember this was his first year, first few games starting) blunders and implying that’s what his entire season was about. He became much better towards the end of the season as he started to get more reps. He was pretty good in the Cotton Bowl. And that makes him poised for a big junior year. Like I said in my first post.. you’re being wayyyyy too critical of these first year starting corners. Apart from Marshon Lattimore, just about every OSU corner under Coombs struggled during their first season as a starter.